The Skills Funding Agency (SFA) has released the identities of the 97 providers who paid back £554k after a surprise in-year audit — with the Construction Industry Training Board (CITB) worst hit with a request of more than three times anybody else at £150k. 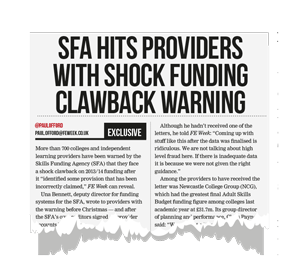 Una Bennett, deputy director for funding systems for the SFA, wrote to 699 providers before Christmas warning of a shock clawback on 2013/14 funding, because “some provision has been incorrectly claimed”, as exclusively revealed by FE Week on January 9 (pictured right). The SFA said the following month that it had “resolved the identified issues” with more than 600 providers who wouldn’t have to return any 2013/14 cash, but it estimated that a total of £500k would need to be repaid by more than 90 providers. And it has now revealed, in response to a Freedom of Information request lodged by FE Week, the identities of the 97 providers asked to repay. 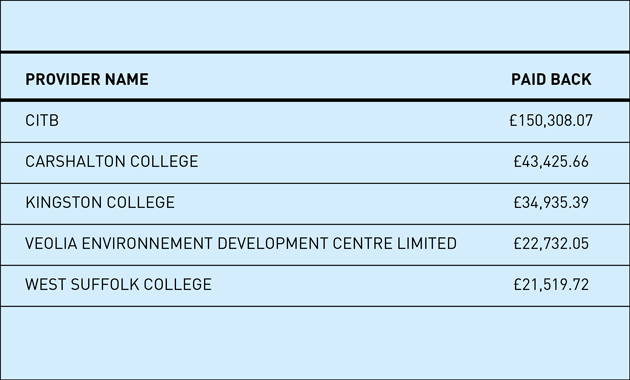 The average amount paid back among the 97 providers was £5,711, but the five highest sums to be repaid were from CITB, Carshalton College, Kingston College, Veolia Environment Development Centre and West Suffolk College, respectively. 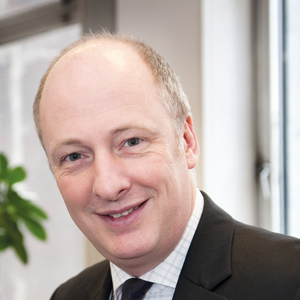 Peter Mayhew-Smith, principal of Carshalton and Kingston colleges, which were federated in 2012 but retain separate governing bodies and were allocated a combined £8.7m by the SFA in April, said: “From 2013/14, students over the age of 24 have had to either pay for a level three programme themselves, or apply for a 24+ learning loan. Kingston College and Carshalton College processed over 600 24+ learning loans for 2014/15. A spokesperson for West Suffolk College, which was allocated £1.2m by the SFA in April, said: “It [the repayment] related to 10 apprentices who genuinely achieved their programmes prior to the projected end date. Meanwhile, the SFA revealed in its June ‘Inform’ newsletter that it had uncovered incorrect funding claims for 2014/15 after another in-year review. Did they have to pay anyone more as a result of the ‘audit’ or is it a one way street.? Veolia Environnement Development Centre Limited – is that the correcdt spelling or does someone at the SFA need to undertake Functional Skills English? I think that publicising clawback of £555 on million pound contracts is just silly! Every Audit will find something (thats the point!) and whether it’s someone pressing the wrong button (commonly known as humanitis)or the SFA’s “interpretaion” of the rules (which has been known to change – depending on the financial status at the time)mistakes/misinterpretations can happen. I don’t see any metiion of the SFA having their own audit qualified!